I’ve reviewed a couple of Fiestas from Ford in the last couple of years, and I’ve liked most of what I’ve found. 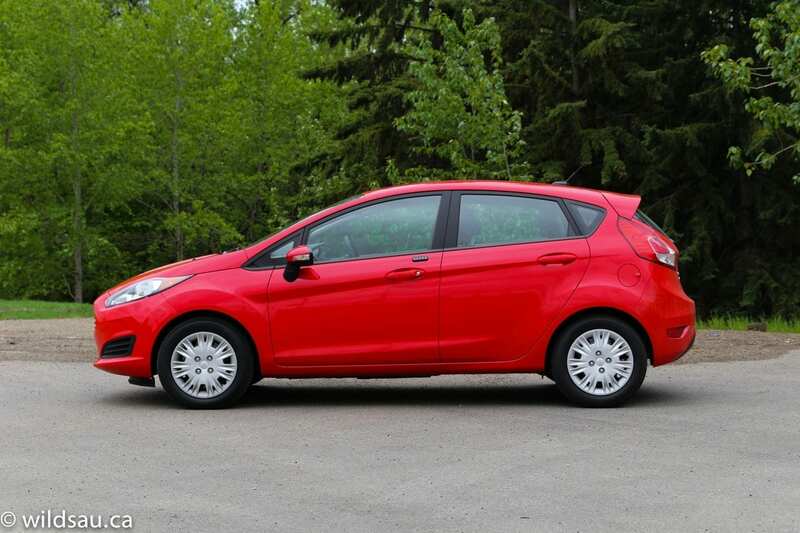 The subcompact class has a lot of competition, but the refreshed 2014 Fiesta has a lot to offer. Especially under the hood. 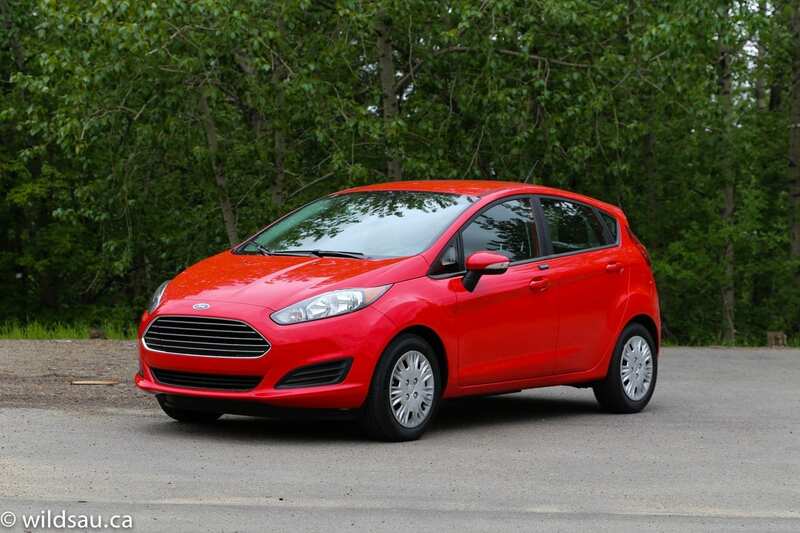 The Fiesta’s exterior has been refreshed and slightly updated for this model year. While remaining familiar, you might notice the new hood (with some character lines on it) and a revised front fascia with a new grille and headlights. The rear end gets new tail lights that look great, and the overall package is an attractive one. 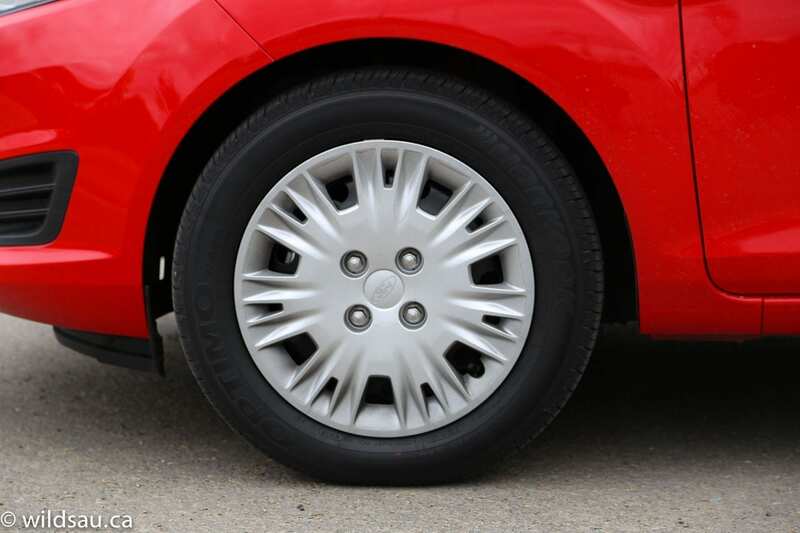 Unfortunately, the entry level trim on my review car leaves it with some pretty cheap-looking 15-inch wheel covers and skinny 185/60-sized tires. They don’t look horrible, but the optional appearance package (on my previously reviewed Fiesta SE) makes a big difference. A fairly basic interior greets you when you get in. It’s mostly black, which is typical for this class of vehicle. The upper part of the dash is a giant, sculpted piece of soft-touch plastic, although it has a strange pebbled texture on it. 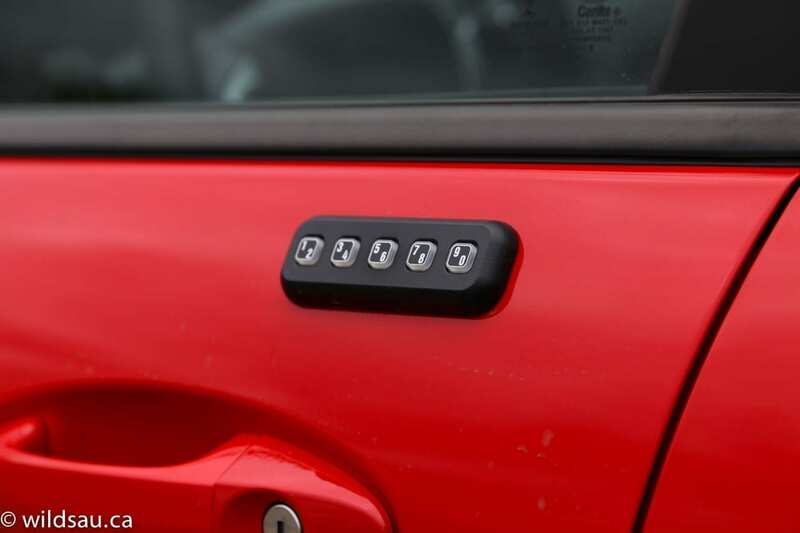 The rest of the dash and the door panels are crafted of hard plastic, with the exception of a small upholstered elbow pad on the door. I found the heated manually-adjustable fabric seats to be reasonably comfortable, but thought they could offer more supportive bolstering. The steering wheel is decent, and has controls for the audio system, phone and cruise. There are two basic gauges, separated by a basic driver information screen. More about that later. Front and centre in the dash sits a small screen for the SYNC system. You manage your stereo with SYNC, as well as the phone function. It’s controlled by a jumble of hard buttons (including a numeric keypad) below the screen, and you make your way around the tiny screen using a horrible joystick-type knob with a button on it. Truthfully, it is one of the worst user interfaces I’ve used in a while, and I never got used to it. 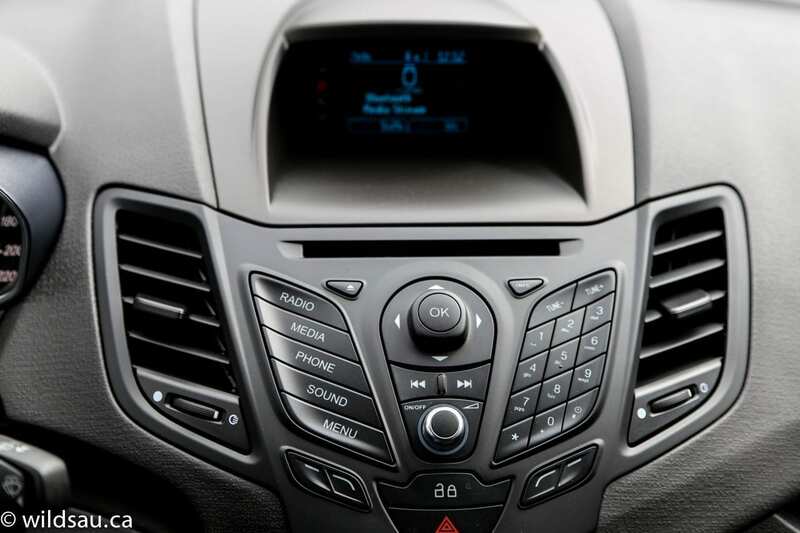 It made me yearn for MyFordTouch (MFT), to be honest – the application of MFT with its smaller screen, etc in the Fiesta leaves something to be desired, but it’s a heck of a lot better than the SYNC business. The sound system is fine, and will play from AM, FM, CD, auxiliary, USB and Bluetooth streaming sources. 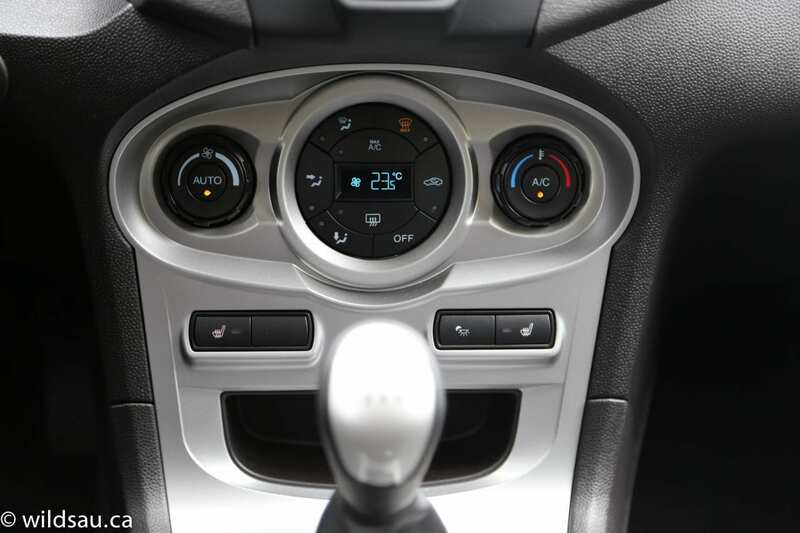 The centre console is where you’ll find the shifter, a traditional parking brake lever, a drop-in bin (combined with a 12V and a USB plug), two cupholders and an armrest. 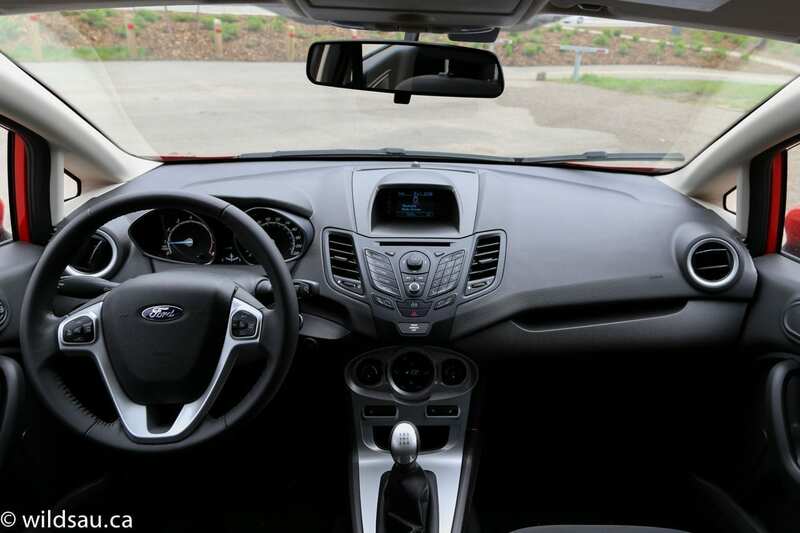 The basics are all powered, of course – door locks, windows and mirrors, and the Fiesta has automatic headlights, which is a nice touch. The vehicle is started with a good old-fashioned key, which has remote locking buttons on it. There are three seats in the back, but let’s be honest here. The middle one is too narrow for most people, including kids. 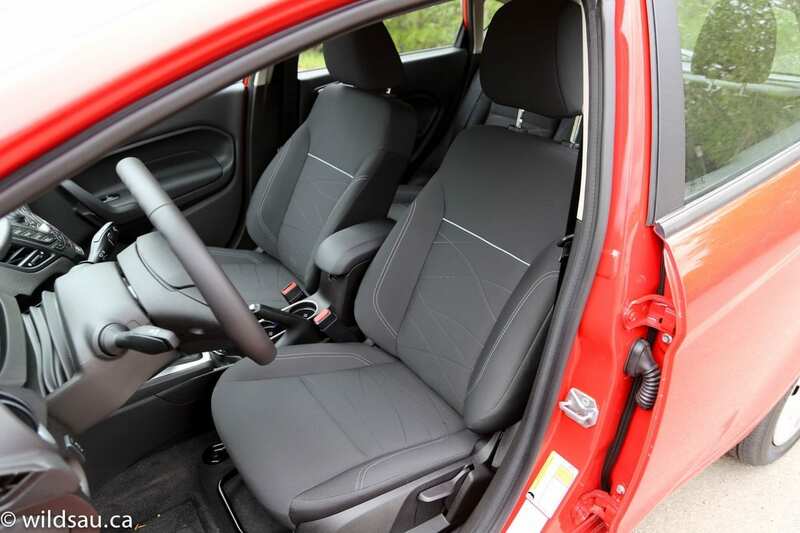 Add to that the fact that the centre console extends rearwards a bit, intruding into the middle foot space, and it really becomes impossible for anyone to sit there comfortably for any period of time. While the seats were quite comfortable, I found the head and leg room to be limited for me (I’m 5’10”). Our three kids felt quite cramped width-wise in the back of the Fiesta. You get two sets of LATCH anchors for children’s seats. The Fiesta’s trunk is acceptable for a small 5-door hatch. While 422 litres isn’t a lot, it’s competitive and very usable. There’s quite a lip that you’ll need to lift over in order to drop stuff into the trunk. 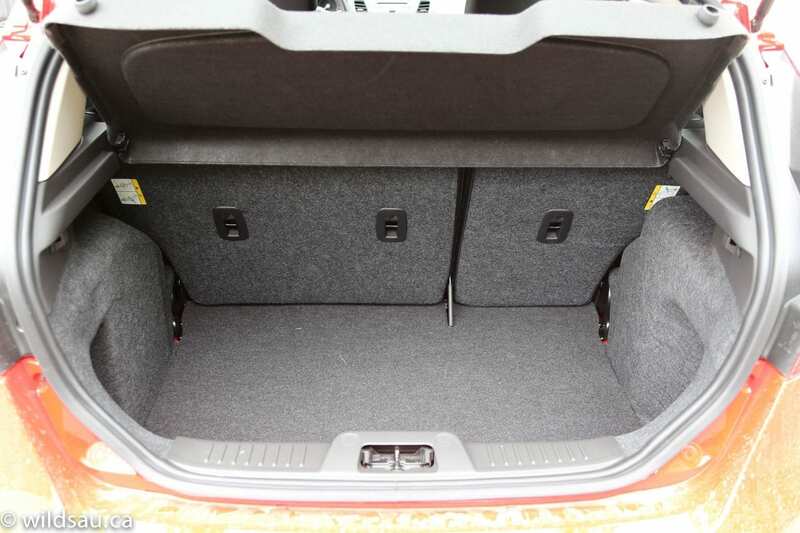 You can fold the rear seats down (they split 60/40 – but don’t expect them to fold nice and flat) and that will increase the space to 719 litres, enough to move a substantial amount of stuff. 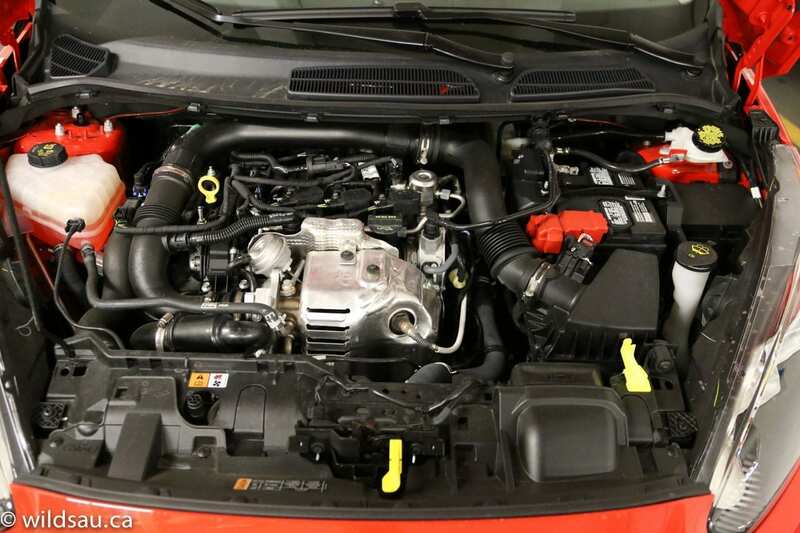 Here’s the real story with this car – the brand-new pipsqueak of an engine under the bonnet. Ford’s newly available 1.0-litre turbocharged direct injection 3-cylinder EcoBoost, putting out 123 horsepower and a delicious 148 lb.ft of torque. 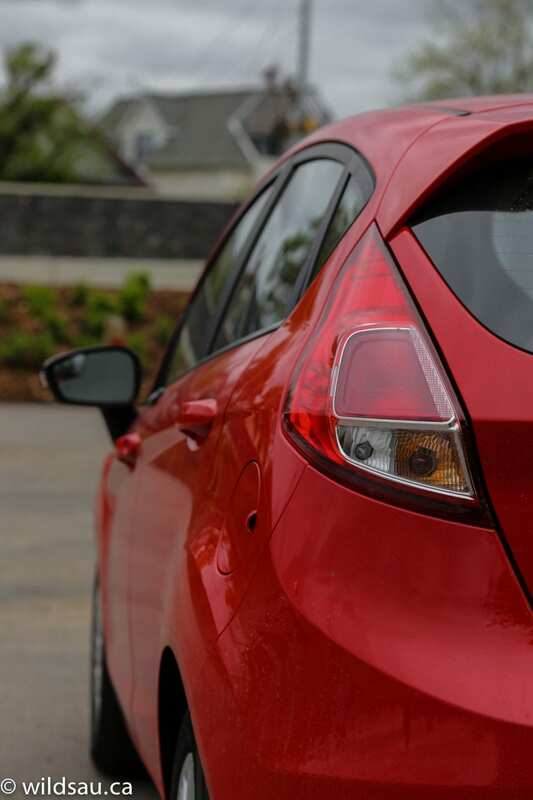 It’s mated to a 5-speed manual transmission and as always, the Fiesta is front-wheel drive. Hilariously, Ford notes that this engine has a higher specific output (which means horsepower per litre of displacement) than the Lamborghini Aventador’s engine. While that spec is impressive on paper, I’m not quite sure why they’d bring this up. There’s a bit of a disparity between every single detail of those two vehicles. Oh well, I guess that seemed like a good comparison to someone in the marketing department. 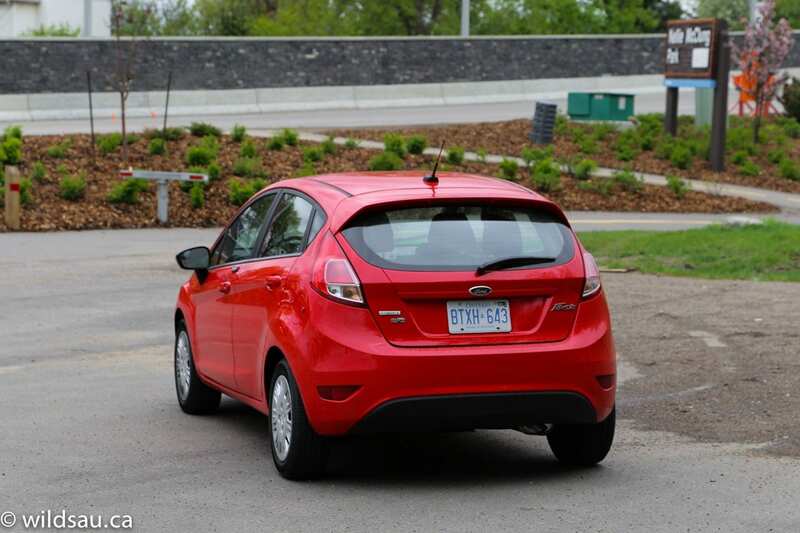 Without getting more specific, Ford indicates that the engine is projected to achieve 40+ US mpg, or somewhere in the neighbourhood of 5.5 L/100 km. 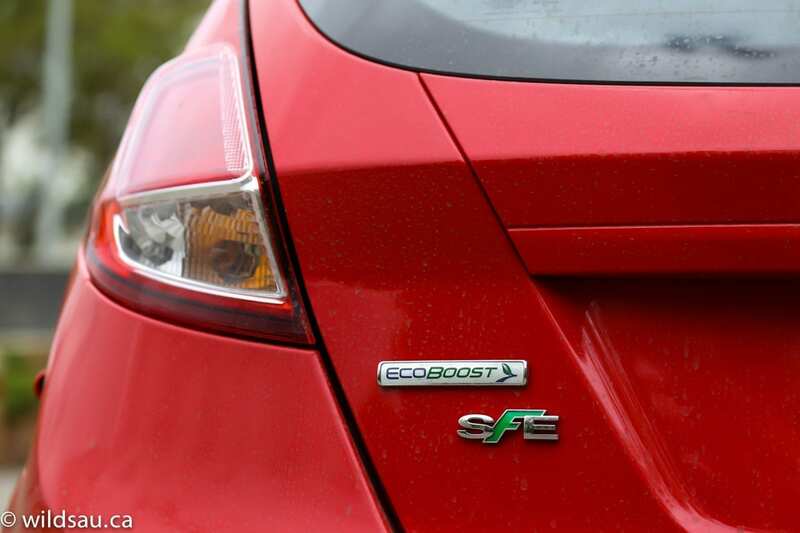 Which is awesome fuel economy, formerly reserved exclusively for hybrids. Ford claims it is best-in-class. Unfortunately, I can’t actually tell you what kind of mileage I got during my week with the Fiesta, as the trip meter screen was messed up. All it did was alternatingly flash the odometer and the word “Paused”. A number of attempts to rectify the situation with the help of Ford Canada technical help didn’t work. Of course, this would be fixed under warranty but it was irritating to find this in a brand-new vehicle. Not to mention being unable to monitor my fuel economy. It’s no surprise that the tiny EcoBoost is a dog at low RPMs, but it doesn’t take long for the boost to come on, and when it does, the little mill provides a surprising amount of pull. There’s plenty of get-up-and-go when you’re on the gas (once you overcome the turbo lag), and there’s enough power for puttering around town too. The generous torque figure makes all the difference – while Ford’s literature doesn’t seem to disclose when the maximum torque is available, I can attest that it’s at relatively low revs (lots of goodness on tap at 2500 RPM and higher) and it remains on tap for quite a while and that fat little torque curve is quite flat and linear. All that adds up to a very decent driving experience, as long as you don’t try to lug it around at low RPMs – that will make it grumpy. Though I wouldn’t go so far as to call it “thrill-packed” as Ford puts it. 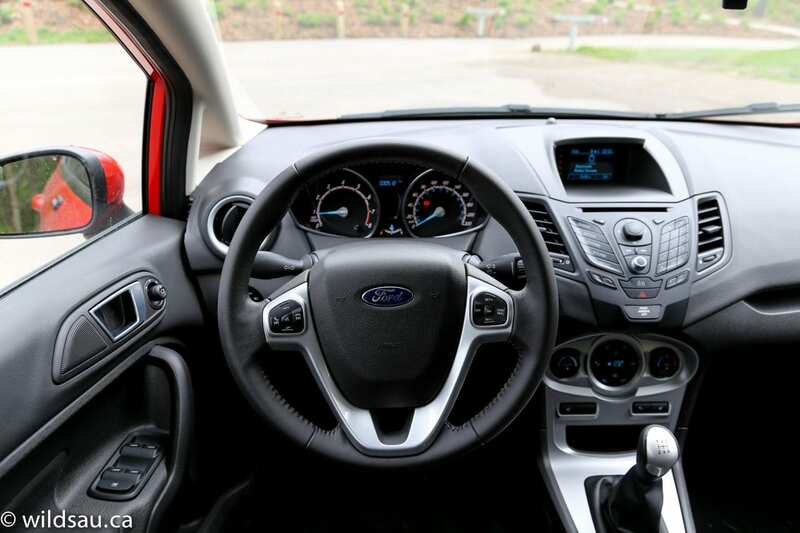 The Fiesta’s manual transmission is very easy to drive with. Clutch effort is light and the take-up is gentle and forgiving, which makes the experience less sporty but easier to live with day-in and day-out, especially in bumper-to-bumper urban commuting. 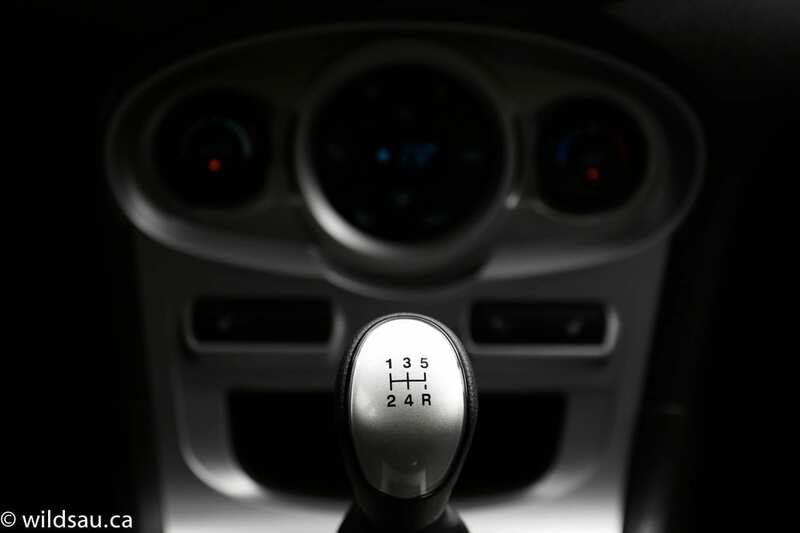 The shifter is notchy and rubbery – certainly not one of the best out there, but good enough. The gear ratios are spaced out nicely for a daily driver. I was very impressed with the ride. While some of the hits over road irregularities got a bit noisy, the actual vibrations were well dampened, especially for this class of vehicle. The handling is decent, with quick turn-in and a nimble, agile feel around town. I felt that the car’s character changed on the freeway and even more so on the highway, where things started to feel a bit jittery and nervous. I also felt that the electronic steering was a bit overboosted at higher speeds, and the car suddenly felt quite susceptible to ruts and undulations in the road – something I didn’t feel in the city. Noise levels are also well dampened – road and wind noise were excellent for this vehicle category. Under throttle, you’ll hear a very new sound from the three-cylinder under the hood. It presents a snarl that’s unlike anything else I’ve driven, and I actually found it quite addictive. Of course, if you’re just driving normally, there’s very little noise coming from the engine bay. See the optional keyless entry pad in the options list? It’s a nifty innovation that Ford has continued to stick with in their vehicles throughout the years. A lot of owners really like the option. But why, oh why does the one on the Fiesta have to be so nasty? It’s an ugly pod, stuck onto the door, and looks like a complete third-party afterthought. I’ve liked the Fiesta in the past. The driving experience is a good one, especially with this highly tractable new 1.0 EcoBoost engine, and overall, it is a very upscale feeling car for this price. I have to say I really hated the SYNC system in this review vehicle, and I was a bit put off by the non-functioning trip meter, because I was very eager to see what kind of fuel economy I’d get. But I still enjoyed the drive, and would absolutely go for this new engine if I were to buy a Fiesta. I give the 2014 Fiesta a 7 out of 10. With the 1.0 EcoBoost, but upgraded to MyFordTouch and maybe an appearance package, I’d make that a 7.5 out of 10. WAF (Wife Acceptance Factor) was limited to passenger experience, as she doesn’t drive manual transmissions. 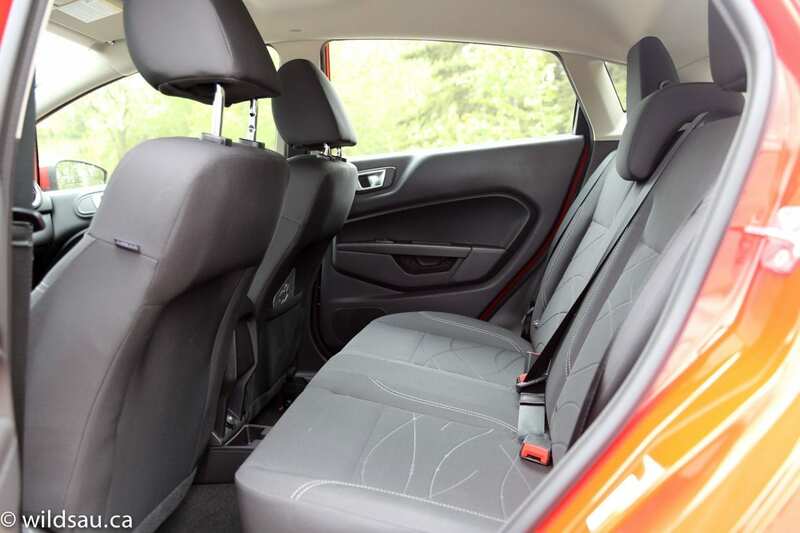 She said it felt quite refined for an entry-level car, but wasn’t a fan of the limited rear seat room for our kids, or the relatively small cargo space – this is all coming from a mom of three perspective. I’m guessing most families of five wouldn’t be considering the Fiesta as their main mode of transportation though.